The healthy lifestyle market has become a big moneymaker, and no product is more emblematic of this expansion than Fitbit, which is now a publicly traded company. More power to it! If people are willing to shell out at least $60 for a pedometer (but realistically more than $100), Fitbit must be doing something right. But people will pay for anything -- the real question is, does it make a difference? 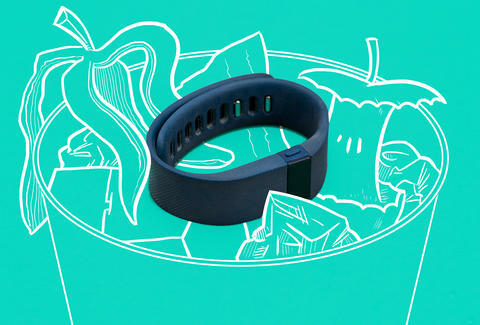 Does owning a Fitbit actually help you get healthier? That magic step-count number you'll walk circles in your bedroom until 11:59pm to reach is arbitrary. It's a nice, round number, but there's not much evidence 10,000 is significantly better than 9,000, or much worse than 11,000. Obviously, movement is going to benefit you, especially moving more than you already do. You could make a pretty sweet paper doll collection out of all the studies warning you how bad it is to sit too much. But if you're going on 10,000 steps, you should know that the number came from pedometers sold in Japan during the 1960s. They were called "manpo-kei," which means "10,000 steps meter." And they were a hit! Subsequent research backed up the theory that increasing activity levels to 10,000 steps per day has health benefits, but most sedentary people would see improved health after getting more active, regardless of the activity. 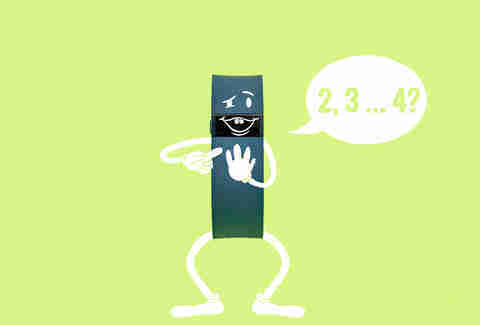 It's not the number that bestows health on you. OK, sure, the number of steps you walk doesn't matter so much, but achieving 10,000 steps each day isn't necessarily the goal. Maybe you simply want to drop a few pounds, and figure the extra motivation of owning a fitness tracker and having fun, if ultimately meaningless, numbers to hit can't hurt, right? Wrong! Researchers wanted to know whether wearable fitness trackers like Fitbits, helped people lose weight compared to other behavioral weight-loss techniques, and the short answer is: They don't. In fact, participants who wore fitness trackers during the study lost less weight over two years than those who didn't. Both groups were given six months of low-calorie diets, increased physical activity, and counseling; both groups then had access to telephone and text support for six months. After that, they were divided into two groups, one with fitness trackers and one without, and despite the fact that everyone had undergone diet, exercise, and psychological treatment, the fitness trackers failed to help people drop extra pounds. So you're better off spending your money on vegetables, or putting it toward a gym membership. The Centers for Disease Control and Prevention (CDC) doesn’t think in step counts when developing guidelines to keep Americans healthy, unfortunately for the fitness-tracking industry. Fitbits and other activity trackers become unnecessary when you realize that the base recommendation for adults is 150 minutes of brisk walking over the course of seven days. All you need is a watch to track that. When you add in the fact that you need to be incorporating strength training into your weekly routine -- which most activity trackers aren’t equipped to track (or do so in a clunky way) -- the effort to achieve 10,000 steps seems even more Sisyphean. Maybe you love the rush that comes with notching a personal step record, or maybe you can't get enough of that calories-burned number lighting up your wrist. But take that data with a finely tuned algorithm of salt. This is important to remember when it comes to that "calories burned" screen on your tracker. Lardner says that simply tallying up steps isn’t a license to eat more and doesn’t automatically make you healthy. It needs to be seen as a small piece of a larger puzzle. “It can be a great motivator, but just because you reached your 10,000 steps for the day doesn’t mean you can mow down a pint of ice cream on the couch that evening,” echoes Erin Truslow, a USA Triathlon coach, USA Cycling coach, and founder of Big Pistachio Coaching and Training. Fitness trackers are pretty good at tracking things like your steps and heart rate... wait, "pretty good" isn't great for a device that basically has one job. Track these things! Fitbit has a whole section of its site dedicated to inaccurate readings, and when "opening a door" or a literal "gust of wind" can throw off your numbers, you might want to think about what you're really extracting from all this data. Sorry if that ruins the dopamine rush you get when your wrist buzzes, indicating you've hit your 10k. And that's something you really need. Most smartphones come with some kind of tracker -- now you know. So are you saying I need to throw out my Fitbit? For some people, Fitbits and other fitness trackers are great motivators that encourage physical activity in people who otherwise wouldn't get enough of it. You don’t need to ditch your Fitbit if you feel like it adds value to your life. It took a few days to realize that my fitness tracker was really just a glorified watch. But if you obsessively pace around until you get 10,000 steps, use it as a way to feel better about Netflixing and killing a tub of ice cream, or scrounge up your last few dollars just to buy the latest upgraded version? You can probably do without it. Your health, while it should be a lifestyle, isn’t one you should buy. I recently lost my fitness tracker. It was safely on my arm for most of the day, then I looked down and it had fallen out of its band. I turned the house upside down looking for it, and was upset for a few hours. How was I going to track my steps and sleep? You know what the most inconvenient part has actually been? Not being able to look down at my wrist for the time. It took a few days to realize that my fitness tracker was really just a glorified watch. Ashley Lauretta is a freelance journalist and editor who won't be replacing her activity tracker. Follow her at @ashley_lauretta as she ditches living by the step count.